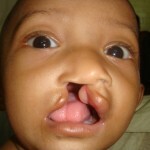 Cleft lip and palate (CLP) is a common birth defect with a global prevalence of between 1 in 5-700 live births. CLP can cause problems with feeding, speech, hearing as psychosocial issues. Treatment is prolonged and orthognathic surgery is frequently performed to correct maxillary hypoplasia. Distraction osteogenesis, which achieves bone lengthening by gradual mechanical distraction, was first used in orthognathic surgery in the 1990s and is an alternative intervention. The aim of this review was to provide evidence regarding the effects and long-term results of maxillary distraction osteogenesis compared to orthognathic surgery for the treatment of hypoplastic maxilla in people with cleft lip and palate. Searches were conducted in the Cochrane Oral Health’s Trials Register, the Cochrane Central Register of Controlled Trials (CENTRAL), Medline, Embase, LILACS, ClinicalTrials.gov and the World Health Organization International Clinical Trials Registry databases with no language restrictions. Randomised controlled trials (RCTs) comparing maxillary distraction osteogenesis to conventional Le Fort I osteotomy for the correction of cleft lip and palate maxillary hypoplasia in non-syndromic cleft patients aged 15 years or older. Two reviewers selected studies and independently extracted data and assessed risk of bias and standard Cochrane analysis methods were used. 1 study involving a total of 47 reported in 6 studies was included. The study compared maxillary distraction osteogenesis with orthognathic surgery, and included participants from 13 to 45 years of age. The study was trial at high risk of bias, with a small sample size. The main outcomes assessed were hard and soft tissue changes, skeletal relapse, effects on speech and velopharyngeal function, psychological status, and clinical morbidities. Both interventions produced notable hard and soft tissue improvements. The distraction group demonstrated a greater maxillary advancement, (advancement of Subspinale A-point) a mean difference of 4.40 mm (95% CI 0.24 to 8.56) was recorded 2 years postop. Horizontal relapse of the maxilla was significantly less in the distraction osteogenesis group five years after surgery. A total forward movement of A-point of 2.27 mm was noted for the distraction group, whereas a backward movement of 2.53 mm was recorded for the osteotomy group (mean difference 4.8 mm, 95% CI 0.41 to 9.19). No statistically significant differences could be detected between the groups in speech outcomes. Maxillary distraction initially lowered social self-esteem at least until the distractors were removed, at three months postoperatively, compared to the osteotomy group, but this improved over time and the distraction group had higher satisfaction with life in the long term (two years after surgery) (MD 2.95, 95% CI 014 to 5.76). Adverse effects, in terms of clinical morbidities, included mainly occlusal relapse and mucosal infection, with the frequency being similar between groups (3/15 participants in the distraction osteogenesis group and 3/14 participants in the osteotomy group). There was no severe harm to any participant. This review found only one small randomised controlled trial concerning the effectiveness of distraction osteogenesis compared to conventional orthognathic surgery. The available evidence is of very low quality, which indicates that further research is likely to change the estimate of the effect. Based on measured outcomes, distraction osteogenesis may produce more satisfactory results; however, further prospective research comprising assessment of a larger sample size with participants with different facial characteristics is required to confirm possible true differences between interventions. As the authors note maxillary distraction osteogenesis is a new and emerging technology for the treatment of cleft lip and palate. This well conducted review only identifies a single trial with a small number of participants and while it suggests that the new technique may be more stable five years following surgery the quality of evidence is very low. Well conducted, and reported high quality trials are needed to confirm potential benefits. Kloukos D, Fudalej P, Sequeira-Byron P, Katsaros C. Maxillary distraction osteogenesis versus orthognathic surgery for cleft lip and palate patients. Cochrane Database of Systematic Reviews 2016, Issue 9. Art. No. : CD010403. DOI: 10.1002/14651858.CD010403.pub2.